You Need: one pawn for each player, one six sided die, about 50 counters to represent squirrels plus one distinct counter to represent Devil Bunny. Game Synopsis: You are a Taffy Machine, represented by a pawn that never moves. The Taffy Factory is a collection of platforms connected by a web of pipes. On your turn, you gain control of the squirrels on a random platform, moving them en masse along any of the pipes and dropping one squirrel on each platform along the way. If you can bring a squirrel to yourself, you score it. Six squirrels is enough to gum up your works and win you the game. FAQ: Devil Bunny moves like a squirrel. This means he is treated like any other counter. This isn't completely clear in the rules, so we get asked about it a lot. The best strategy to move Devil Bunny really far is to deposit a number of squirrels in his office when you get the chance. This is referred to as "charging the Bunny." 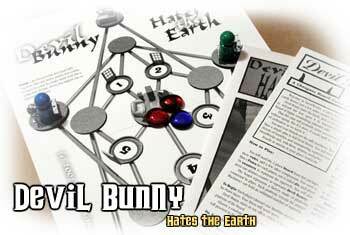 Then, when you finally roll a 6, you can get Devil Bunny all the way to an enemy Taffy Machine, or wherever else you want him. FAQ: You have a choice on each turn: to add a counter to a space -or- to move the counters on that space. The rules might imply that you do both; the text of "On Each Turn" should read: "If you roll a number between 1 and 5, you will do one of the following:"